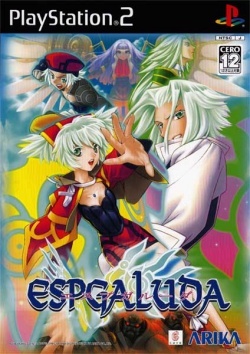 Game description: PlayStation 2 version of the popular Japanese arcade shooter. In this top-down, vertically scrolling 2D shooter you choose to play as either Ageha or his female companion Nuteha. Ageha uses a straight-line standard and Rapier shot, while Nuteha's standard fire is spread like a fan. Both can utilize a guard barrier that protects them from incoming projectiles, or use the energy built up in the barrier gauge to deliver powerful guard barrier attacks of different strength levels. Pick-up items include partial (P) and full shot upgrades (MP), guard barrier refills (E), and energy refills (L), among others. The home version adds an additional gameplay mode and top player replays available on a bonus DVD. The game include different modes such as arcade, simulation, gallery, and a walkthrough DVD video featuring replays by Clover-TAC and KTL-NAL. In arcade mode, the player can configure screen orientation, wallpaper, stage map display, controller vibration, among other settings. Simulation mode simulates an arcade mode stage. The player can configure death, rank, guard barrier gauge, kakusei over start/level, power level, seireiseki counts, and gold ingot counts. In addition, the player can also save or load a replay. This page was last edited on 1 February 2016, at 21:11.